For 2010 an impromptu squadron of neighbor’s boats planned and prepped for their own boat parade, official, authorized, escorted, or not. This year the evening was ideal with no wind and a mild temperature. 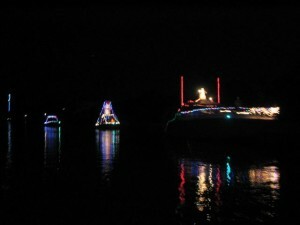 Several power boats and sailboats with structures adorned with lights and ornamentation started at dusk and presented to anyone willing to turn away from their TV screens, a beautiful parade of Christmas cheer and music, traveling from near the Key Royale bridge, in and out of the Grand Canal, and up and out the channel to the City Pier in pitch-black moonless sky. Those people who resided on the waterfront or dined at the Pier Cafe watched the unofficial parade clapped and cheered along with the enthusiastic participants. For Anna Maria Island people who missed the local event, Bradenton and Cortez are holding their own versions on Dec 11th and 19th respectively.